The downpour has worn itself weak and has drained down to a damp drizzle. The media will soon lose interest in the story and will cease flaring up our television screens with those dramatic scenes of enraged waters hurling themselves against buildings and bringing them down like the proverbial pack of cards, tearing down temples and tossing around trucks.... so like an infuriated child throwing an uncontrollable tantrum.... ripping and smashing and hurling and destroying! 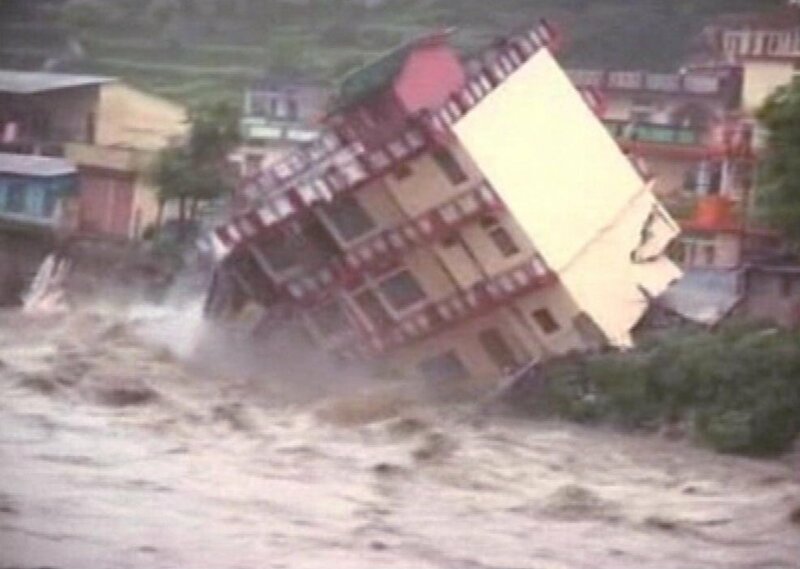 And as we gasped at these Hollywoodian like horror scenes, we had to pinch ourselves into remembering that this frightful flood footage, that roared and rushed across our screens, was not produced on some cleverly crafted film sets – that this was real, this was Uttarakhand, this was happening even as we watched it! And with the stormy waters came stormy questions. And the answers are strewn all around us like the wreckage left by the floods. Never ending construction of roads to accommodate ever increasing tourism. Rapid multiplication of vehicles plying on those disastrous roads. Frenzied expansion of hydro-power projects promoted by the hydel mafia. Unchecked deforestation stripping the slopes naked. Illegal constructions and encroachments. This sin list has no end. But the details are there in the newspapers and on many a website so I don’t need to enumerate all those man-made factors that fatally aggravated this disaster. It was not ‘an angry child in a fit of rage’, it was a consortium of crooked adults with greed gushing through their veins who were responsible for this painful tragedy. But this is not a story to which Uttarakhand holds exclusive rights. It’s a story that is shamelessly played out in so many parts of our country. Environmental reports scoffed at, norms flouted, figures fudged, EIAs manipulated, disasters manufactured. And so, as we moan this tragedy, lurking at the back of our minds is the frightening question: could we be next? With the precarious environmental situation that our country has been pushed into, it’s hard to say for whom the bell tolls!